A Brand New Custom Built A-Frame Cabin in the Tall Pines. 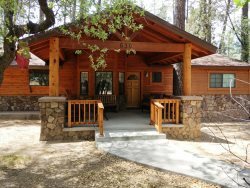 Scenic Pines is a beautiful, A-Frame Cabin located in the tall pines just 6.2 miles or 13 minutes from downtown Prescott. This custom-built property is brand new and designed for both weekend stays or the whole season. The owners have stayed in Prescott Cabin Rentals properties every year for the last 8 years and decided to build their own cabin to share with the world. Wait until you see this! Soothing, creamy whites and sage green tones will immediately put you in a relaxing, vacation mood. Scenic Pines is a three bedroom, two bath cabin that sleeps six people. The master bedroom has a king bed, walk-in closet and luxurious, en-suite bath. Beautifully decorated and wonderfully appointed, sweet dreams await you here when your day is through. The bathroom has a walk-in shower with bright, natural lighting and lovely tile and wood finishing touches. A large, flat-screen cable TV faces the bed so snuggle in and watch a movie. The second bedroom has a queen bed, views to the north and west and whimsical décor. The hall bath is shared with the third bedroom and has a tub/shower combination. All linens and towels are included in this unique property. Bedroom three has two twins. Sleeping here will bring out the inner child in all of you. Varying from Swedish charm to Disney fun this cheery space will delight and entertain. Scenic Pines is located in an area of Prescott called Groom Creek. Known mostly for its vicinity to Goldwater Lake and prospecting past, this tall-pines community offers picnicking, hiking, mountain biking, bouldering and horseback-riding year-round. The Lake is small but offers great views and recreation including volleyball, horseshoes, fishing and playgrounds. Stocked with rainbow trout you can also catch bass, crappie, bluegill, catfish and sunfish. It’s perfect water for canoeing and kayaking. Okay, back to the cabin… Scenic Pines great-room design includes tall ceilings and windows. Natural light ambiance streams into the great-room with both northern and southern exposures. The kitchen is fully stocked with dishes, utensils, pots and pans. The table is tall with country white finishes and six wooden chairs. From simple snacks to gourmet meals the kitchen is modern and pleasant. Up-scale granite counter tops and stainless-steel appliances, including a dishwasher, complete its simple design. The living room offers comfortable seating with couches and chairs. A large, 55” 4K, cable TV and interesting electric fireplace invites and delights everyone for cozy evenings or early mornings. Let’s go outside! The south-facing back deck is serene and quiet. From your first cup of coffee to your last sip of wine, this is where you will spot deer and relax completely during your vacation in the tall pines. A propane grill makes outdoor cooking convenient. Scenic Pines has a washer/dryer, WIFI, central A/C and heat. Whether this is a quick, weekend stay or a long, summer vacation this new, modern cabin is the one to pick!